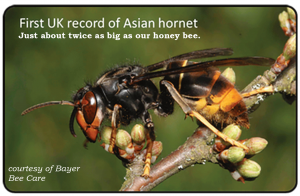 For years British beekeepers have known that the Asian predatory hornet could one day arrive on their mainland. Sure enough, a single specimen was discovered in the Tetbury area of Gloucestershire on September 17. Found by a private citizen, the hornet was positively identified by the British Bee Unit as Vespa velutina, the dreaded Asian predatory hornet. A three-mile quarantine area was immediately established and a hunt for further individuals began. About a week later the nest was found in a conifer, 55 feet off the ground. Global trade hastened the distribution of the Asian hornet from its native homeland in Southeast Asia to many parts of Europe. It was first found in France in 2004 where it apparently arrived in a shipment of pottery from China. From there it spread into Spain, Portugal, South Korea, Japan, and earlier this year it was found on the island of Alderney in the Channel Islands. The hornet can easily travel in wood and wood products, plants, fruits, and cut flowers. In its homeland, the Asian hornet is a predator on the Asian honey bee, Apis cerana. Because they co-evolved, the Asian honey bee is adept at killing the hornet by heat balling. When a hornet is found near the nest, hundreds of bees surround the intruder while vibrating their thoracic muscles, thus raising the temperature within the ball of bees to about 115°F. After about 20 minutes, this elevated temperature kills the hornet. 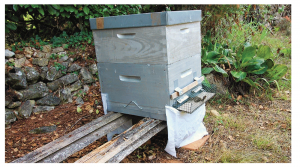 The European honey bee, Apis mellifera, is not equally equipped to deal with this new threat. Although the workers surround the hornet in a similar way, they cannot raise the temperature quite as much and often resort to stinging instead . Although the hornets are very territorial about their hunting grounds, as soon as a hornet snags a bee it leaves its territory and a new hornet takes its place. This switch off takes a matter of just seconds, so an afternoon of bee hunting by a large colony can wipe out thousands of bees. 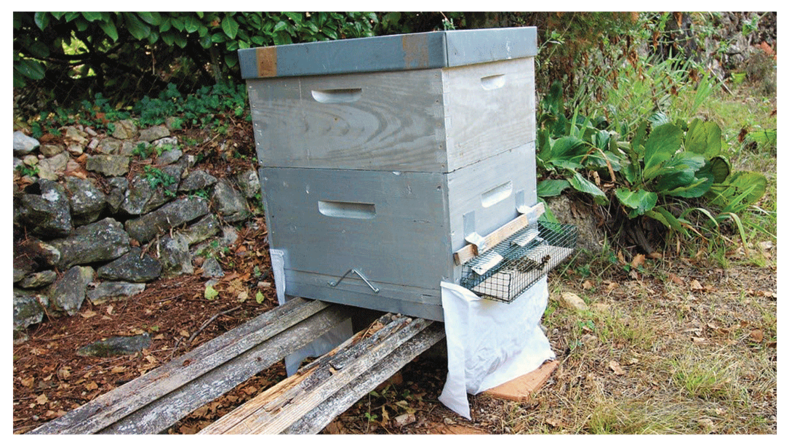 In southern France, beekeeper Michael Judd keeps most of his hives at an elevation of 2600 feet under a small wildflower-covered mountain near the village of St. Vallier. For reasons he does not understand, the predatory hornets have not made their way up the hillsides and his bees remain safe, at least for now. But in his backyard, where he keeps a few small hives, the hornets are vicious. Eager to help in the fight against the hornet, Michael signed up to be part of a government-sponsored experiment to find solutions. “It ended up being no solution at all,” he said. 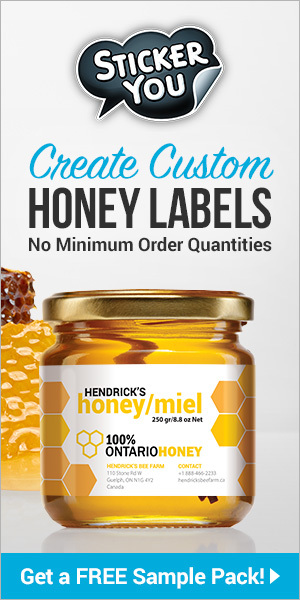 Under the rules of the experiment, Michael lost all four of his participating hives. Shortly after the failed experiment, Michael teamed up with another local beekeeper to work on the hornet problem. “It was the best thing that ever happened to me,” he says. Since their alliance, the two have been successful by using a combination of control techniques and timing each step to the life cycle of the hornet. “None of these measures on their own makes much difference,” he says. 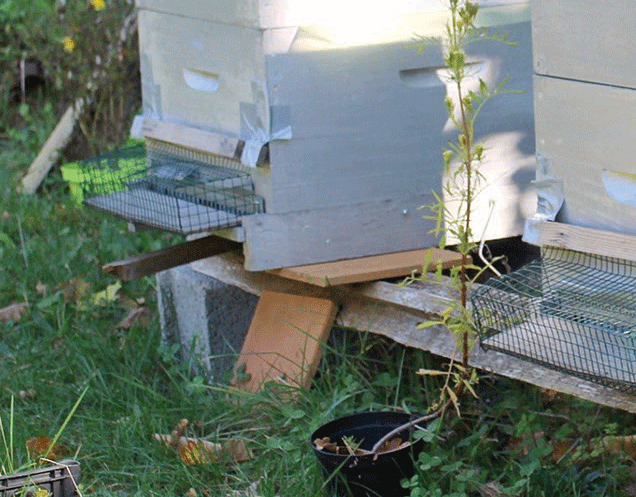 “However all measures together allow me to keep the hives strong.” As a result of his efforts, he has been able to harvest honey and get his colonies through the Winter. Like most wasps, the population of hornets is small in early spring, consisting mainly of overwintered queens. “They emerge in April and search for a place to make a temporary nest. This is a small nest, possibly the size of a golf ball. She lays a few eggs in there, yielding six or eight hornets.” The young hornets then search for food and a suitable place to make the main nest, usually high in a tree and up to several feet around. Beginning in Spring Michael sets out traps. “I put out a trap made out of a plastic water bottle with a special hornet attractant provided by my local bee association. 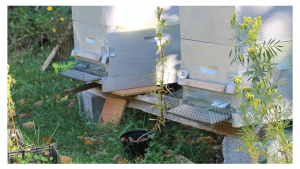 A second trap contains a mixture of white wine, apple vinegar, and cassis (a black currant liquor).” Trapping is important because catching the queens in spring reduces the chance of a large colony being formed. At this early time of year, Michael traps about 10 hornets a week. For a while during the early Summer the hornets seem to disappear, although from time to time he sees one or two around the garden hives and has even seen bees and hornets foraging side-by-side on a single plant. But by midsummer, increasing numbers of hornets gather near the hives. The hornet hovers in front of the hive, awaits a departing or returning bee, and catches it in midair. It takes the bee to a tree where it removes the head and wings before taking what’s left to its nest. “At this time of year the hornet will only go into the hive if the bees are very weak, not flying, and unable to attack in numbers. I have seen the bees attack and kill a hornet, so generally the hornets do not like going in the hive.” However, by mid to late September, the hornets are desperate for protein and become bolder. Behind the muzzle, Michael’s bees set up what he calls a “line of defense.” The bees line up on the floor of the muzzle which provides a protected landing strip for the bees and positions a contingent of bees ready to attack any hornet bold enough to enter the muzzle. Asian predatory hornet colonies die at the end of the Summer. Just before the first hard freeze, the mated queens find a protected spot where they can spend the winter, often in a tree or in the ground . 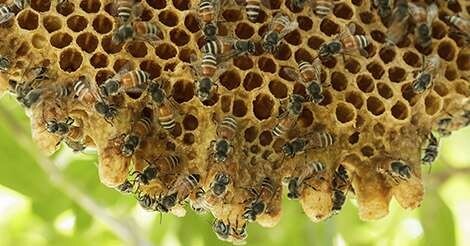 According to Britain’s National Bee Unit, a successful overwintered queen will produce a large nest and raise as many as 350 daughter queens. Asian hornet identified for the first time in the Channel Islands. Pest Control News. 12 July 2016. Retrieved September 25, 2016. Egelie AA, Mortensen, N, Gillett-Kaufman JL, Ellis JD. 2015. Apis cerana Fabricius (Insecta: Hyenoptera: Apidae). University of Florida, IFAS, Entomology and Nematology Department, Featured Creatures, EENY-616. (January 2015). Vespa velutina In: Invasive Species Compendium 2014. Wallingford, UK: CAB International. www.cabi.org/isc. Retrieved October 1, 2016.